Aukstaitija culinary route is located in Anyksciai, Utena, Ignalina and Zarasai districts. Recommended duration of the route is two days. The route begins in Anyksciai, where tea drinking ceremonies are being held. There are no such ceremonies anywhere else in Lithuania. The “Tea Road in Anyksciai” tasting ceremony warms not only the body but also the soul. Once you have reached Utena, you need to know one rule, you can taste acorn coffee where the oaks grow. Fragrant and exclusive, it’s different, because it’s Lithuanian. During the training, you can enjoy acorn coffee and find out a lot of useful things about this drink. An interesting fact is known about the apple product that originates in Kuktiskes. Exceptional preparation of the product takes a lot of time and effort while they appear on the table. It takes about 40 days to make apple cheese! Different food in Ignalina region is determined by historical circumstances, place of residence, way of life, traditions, customs, dialect, etc. For example, a fish soup has been made in the Ginuciai village since the 17th century when Queen Bona ruled. In order to know that epoch it is possible to take part in the educational training: “The cooking of the fish soup – according to the traditions of the East Aukstaiciai”. Aukstaitija is a large and colourful region, and therefore the bread baking has been characterized by diversity. Today’s bread is eaten daily for breakfast, lunch and dinner. The Slyninka village bread bakers offer to familiarize with the bread during “Bread Way with Feast and Mill Inspection” educational training. Herbs, mixtures and coffee of acorn collected in Anyksciai area are certified as national heritage products. 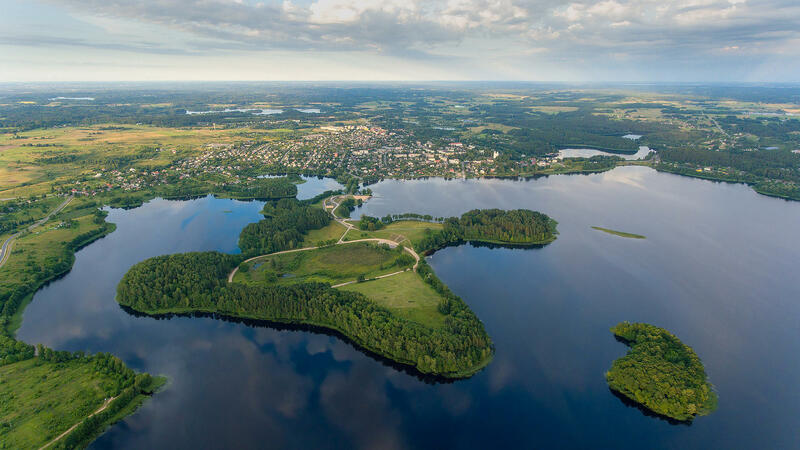 The quality label of Anyksciai regional park product has also been granted. This means that its holder operates in a protected area and does not violate the protected values and has products characteristic of the ethnographic region. Recently, a production of a unique product - Lithuanian coffee from roots, acorns and seeds of Lithuanian plants has been started. Activities: picnic in nature if weather is good, celebration of tea ceremony, stories, tastings, competitions. Educational programs are being held in Anyksciai. Activities: getting acquainted with the history and tradition of coffee and tea production, monitoring the production process and tasting. Educational trainings are being held in Lithuanian. Educational trainings are organized in Utena. Place: Vytauto g. 3, Kuktiškės, LT-28347, Utenos r.
Certified apple cheese recipe has arrived from times of the president Smetona. The aunt of the cheese producer has learned cookery at the same time, producing an apple delicacies both herself and the gentlemen. Over time, the recipe was passed to other female relatives and has survived to this day in Kuktiskes. Fish dishes. Ginuciai, Ignalina dist. Place: Malūno g. 35, Ginučių k., LT-30222, Ignalinos r.
Fish and smoked fish in the Ginuciai village are prepared according to the centuries-old tradition of fishermen of the region of Aukstaitija. The producer is a craftsman certified by the Lithuanian National Heritage Ancient Cooking (in the fields of fish cooking and fish smoking). Most of the recipes are of the 17th century, and the spices and traditions are brought by Queen Bona. Activities: acquaintance with the eastern Aukstaitija from the 12th century, cooking fish soup, tasting of soup and smoked fish. Duration - 1-2 hours, depending on the size of the group. Brewed wheat bread. Slyninka, Zarasai dist. Place: Šlyninkos k., LT-32103, Zarasų r.
Already for three centuries, there is a water mill where brewed wheat bread and brewed rye bread are born. Bread Road with Feast and Mill Inspection. Duration - about 3 hours. Activities: observing the production of rye sifting, wheat wholemeal flour and rolled flour, grains, pancakes and bread. Tasting. The programs are being held in Lithuanian and Russian. Route length: 144 km Duration: 11 h.